It’s just been one of those days when everything I have picked up has dropped, broken, spilled or fallen apart. Just can’t seem to get with it. I haven’t felt well – still trying to get rid of this cough. All that said – today was the most beautiful day of 2008. 70 degrees, sunshine and no wind! Ahh- spring is on it’s way! We got to play in the back yard this afternoon and enjoy the sunshine. Gotta go pay the price now and do the house work. Today is my nephew Todd’s birthday. He is 5 years old! Wish we could be there to help him celebrate. We are planning a trip sometime in mid-April – can’t wait to get some South Carolina sunshine. Emma, Luke and Drew called and sang him Happy Birthday this afternoon and we talked to him for a little while. I felt a few tears puddle up when he said “Aunt Jenni – I can’t wait til you guys come down – I’ve really been wanting to see you.” Then he started speaking boyese about playing legos, bioncles and transformers with Luke. Happy Birthday Todd!! Check out Mike’s blog here for information on the Financial Freedom Experience that is coming to Cornerstone April 4th and 5th. I am looking forward to it like a root canal! Just kidding – I think it is going to kick my tail about some financial discipline that I need. I have flipped through the book and it looks powerful. I am looking forward to the way God is going to use Joe Sangl to challenge us – it may just hurt a little. Sign up soon – you can’t afford not to. I only have a few minutes and then I am dedicating my day to cleaning and schooling. 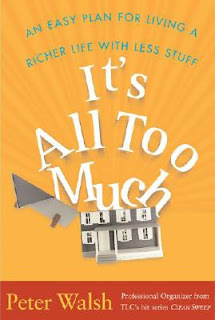 A few weeks ago I finished reading the book It’s All Too Much –here is the post about the book. If you want a good book to get you jacked up about spring cleaning – this is it. I haven’t had a chance to really do all the things I read – getting organized takes time – I am planning to take a few days off from everything else in April and put what I read into reality. It is soo late and I have soo much to do but just needed to get it out of my system! I am pumped about heading to Unleash tomorrow. Mike and I went last year and we were blown away by the messages, the music, the volunteers, the excitement, the passion, the staff . . . I could go on and on! Mostly we were blown away by the passion NewSpring had for people to meet Jesus – it was contagious. Last year we were still a little unsure of where God was leading us. We knew what God was leading us to do just not where. Mike was not full time at Cornerstone -so taking back all we had learned was a little tough. We are bringing 9 more people with us this year from Cornerstone! I am so excited for us all to be encouraged and come back to Galax with a passion to reach people for Jesus. It couldn’t have come at a better time. Tonight our band led worship at a community wide revival. Skateboarder Tim Byrne did some cool stuff with a skate board that would have put most people in the hospital. He had a great message and an incredible humble and authentic spirit that really connected with people. Ken Freeman had an awesome message from Proverbs – first time I’ve heard him preach – powerful. Seeing the response was the best part. There was a group in the seats in front of me that prayed together, held hands, cried together as Ken challenged them to pray together and hold each other up and hold each other accountable. There is nothing like seeing talk lanky 16 year old guys crying out to God together. That never gets old -never!